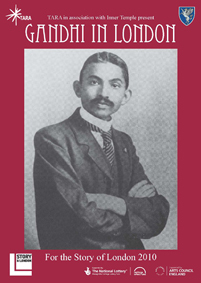 The story of Mahatma Gandhi is inter-woven with the story of London. His three years as a law student at the Inner Temple (1888-1891) were pivotal in shaping his philosophy. During this time he also learnt to ballroom dance, became an advocate of vegetarianism, immersed himself in key spiritual texts and developed a passion for Equity Law. TARA evokes Gandhi’s life in London in the spectacular rotunda of the Temple Church with a company of actors, musicians and dancers. The performance on 2 October, Gandhi’s Birthday, marks the launch of the Gandhi Inner Temple Association. TARA produces global theatre for local audiences. Positioned between East and West, TARA has pioneered cross-cultural theatre for over three decades. In 2009 the company co-produced Hanif Kureishi’s The Black Album with the National Theatre.